Do you like making bread? Do you consider yeast a beast? Do you follow a recipe for a yeast dough to a T? I remember the first time I baked a cake - 14 years old, reading through the recipe at least 35 times, the sleepless night before. Then on D day, ingredients meticulously weighed out, every step read 10 times, and then proceeding to mix the batter. Then panic setting in when I realised I didn't know how to tell if the batter had been creamed enough, comforting myself that anyway, even if the cake flopped, no one would know as it was only for home consumption. Finally, the batter poured into the tin and dispatched into the oven. And the interminable wait- those were days when ovens did not have glass doors. Then the unmistakable aroma of cake baking. Opening the oven door at least 10 times to poke a skewer in to test if it was done. I went through these same emotions when I started baking with yeast. By now, I was an expert at weighing out ingredients. But yeast dough? How do you know if you've added enough water? Kneaded the dough sufficiently? Allowed it to rise long enough? Over-proofed? Under-proofed? My aha moment came when I started experimenting with my first bread machine. No more huffing and puffing while kneading - the machine did all that and then it all began to make sense. Early man made bread, early man had no weighing scales, early man followed no recipes so why couldn't I improvise too? So, after more flops than I care to remember, the intricacies of yeast became less mysterious. The basic dough is, well, basic. To an amount of flour, add some sugar, salt, yeast, maybe some fat, maybe some gluten and water of course. Knead till the dough is springy and doesn't stick to your hands. Leave to rise, punch down, shape, then allow to rise a second time. Pop it into a really hot oven and bake. And then there was no stopping me. I was not happy with the usual bread baked in a loaf tin. I wanted to bake buns, free form loaves, flatbreads, plaits, buns stuffed with chicken, with chocolate, apples, cheese, fish, mushrooms. 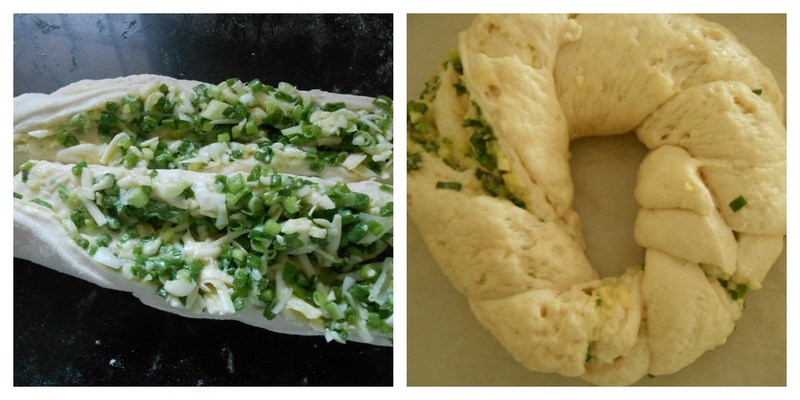 And this garlic, cheese and spring onion twist which is my latest obsession. This roll is a little messy to shape but more than makes up in taste, a classic combination of garlic, cheese and spring onions. So now, do the twist with me! Gather the ingredients. Knead the dough, and after the first proving, roll it out into a square. Spread a thin layer of butter over the top, sprinkle the garlic, cheese and spring onion mix along one side. Roll it up, Swiss roll style. With a really sharp knife, slice it half length-ways. Push the halves together, cut sides facing up and twist the dough. When well twisted, place the dough on the baking sheet and shape it into a circle. Wet one end with a tiny bit of water and stick the other end to it. Glaze the top with beaten egg, leave to proof for about 20 minutes then place in a preheated oven to bake. Sift flour and salt onto a worktop, mix through improver, gluten, sugar and yeast. Make a well in the centre, pour in water and oil, mix till it all comes together into a sticky dough. Knead till the dough is soft and elastic and no longer sticky, about 10 minutes. Place the dough into an oiled bowl, cover with clingfilm and leave to rise in a warm spot for about an hour or till the dough doubles in size. Cut a sheet of parchment paper to fit the base of a baking sheet. Mix all the ingredients for the filling, keep aside. Remove the clingfilm from the bowl, punch down the dough to expel all the air. Place the dough onto a lightly floured worktop, press into a flat disc and roll out into a 30 cm. square. Spread the butter all over the square, spoon the filling only along the length of the dough closest to you. Now roll up the dough as neatly as you can, tucking in stray bits of filling that may fall out. Roll the finished shape back and forth to seal the edge and keep the shape. Dust a sharp knife with flour and cut the roll lengthwise into two halves. Push the sides together, filling facing the ceiling and twist the whole roll. Wet the ends with a bit of water and join them. Transfer onto the prepared baking sheet, glaze with beaten egg and leave for the second rising. The second proofing should be for 20 minutes. Place the tray in the oven and bake for 20-25 minutes or till the roll is golden brown. Tap the roll and if it sounds hollow, the roll is cooked through. Carefully peel it off the paper and place the twist on a wire rack. I love the colour. Makes me want to reach out for it, along ith a hearty soup! Yes, Anees, this is that kind of a bread you just can't wait for it to cool before attacking it. You could leave out the improver, the gluten also if absolutely unavailable, and just give the dough a thorough kneading. I make most of my breads with gluten as the flour I buy is pretty soft.